Egypt's President Abdel-Fattah El-Sisi said in a minesterial meeting late on Tuesday that the state places youth at the top of its priorities, Al-Ahram daily reported. 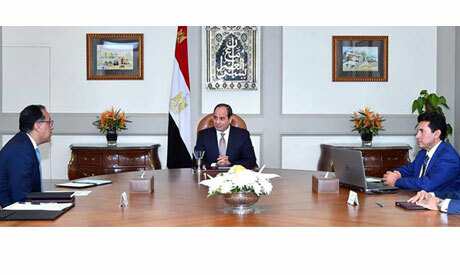 Tuesday's meeting was attended by Prime Minister Mostafa Madbouly and Minister for Youth and Sports Ashraf Sobhy. Sisi highlighted the need to benefit from youth capacity in building the country and set specific programs to encourage youth and motivate them to participate positively in community work. The president also indicated the development of the Cairo Stadium into a sports complex according to the latest international designs, with the aim not only to develop sports facilities in the region, but also to establish service facilities, parks and gardens open to citizens that can be exploited throughout the year. He also called for the development of an integrated vision aimed at establishing and developing the facilities and infrastructure of the sports system in Egypt, in line with the development projects being constructed by the state, including the new road network. The meeting dealt with the presentation of the comprehensive strategic vision of the Ministry of Youth and Sports during the coming period which includes developing youth talents and preparing them for the coming Olympic Games taking part in Tokyo in 2020, according to presidential spokesperson Bassam Rady. Meanwhile, Sobhy reviewed a number of expected projects in this sector, such as the new sports cities, indoor halls, playgrounds and swimming pools being completed in a number of governorates, as well as developing youth centers throughout the republic.